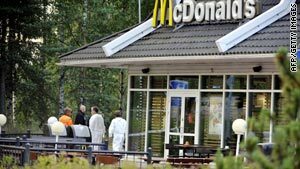 Investigators look for evidence outside a McDonald's in Porvoo, Finland, on Tuesday. (CNN) -- A quarrel between occupants of two vehicles at a McDonald's restaurant drive-through in southern Finland erupted in gunfire Tuesday, leaving three men dead, police said. Three occupants in one of the vehicles have been arrested, said Peter Fagerholm, a detective inspector in the town of Porvoo. The two vehicles were in line at the restaurant about 2 a.m. when the quarrel began, Fagerholm said. Shots from a semiautomatic handgun were fired from a Toyota SUV into a convertible driven by a pregnant woman and carrying four men. Two of the men in the convertible, ages 28 and 45, died at the scene. Another 28-year-old man died Tuesday afternoon at a hospital in Finland's capital, Helsinki, about 50 miles to the west, Fagerholm said. Two of the men were shot in the head, the other in the chest, he said. The cause of the argument was not immediately known. "We believe it was a very small issue" that escalated, Fagerholm said late Tuesday. He said he doesn't believe the parties in the different cars knew each other, or that the shooting was preplanned. The SUV carried one woman and two men, Fagerholm said. One of the men, 41, is the principal suspect. In 1995 he was sentenced to life in prison on one count of murder and two counts of attempted homicide, Fagerholm said. He was released on parole in December. Fagerholm would not release the suspect's name. Authorities are speaking with witnesses in a third car in the drive-through line.